... is a documentation piece, which explores the use of low and high tech methods of recording and presenting time and space, trying to create a sense of memory/history and imagination/future. 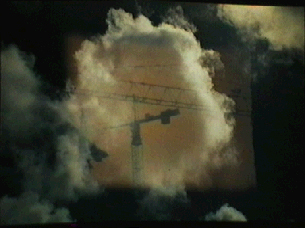 the video piece was originally filmed using super8 cine film and 35mm slide film. these were overlayed and recorded onto hi8 video tape. the video tape and audio tape (hand held recorder) were then edited on a mac avid cinema system. the triptych is part of an ongoing piece (presented in box form) documenting 4 days in berlin during the summer of '97, and any subsequent documents - postcards, tapes, letters etc. that resulted from the visit.